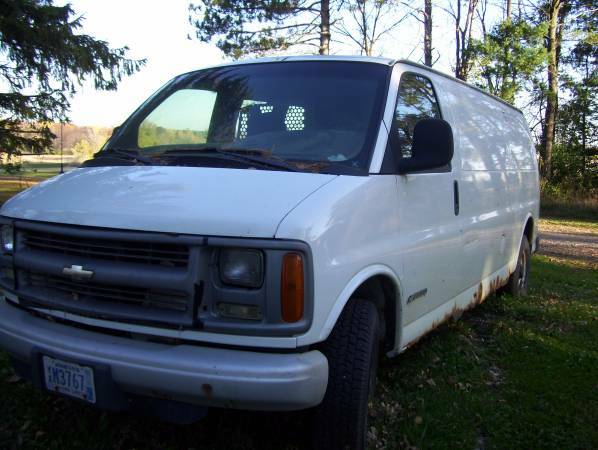 2002 Chevy Express G3500 Extended Cargo Van; 5.7 V8 MPI OHV, Rear Wheel Drive; Color white; Tires: excellent; Air Condition/Heating Systems: good condition; AM/FM Stereo; Gated with door to cargo area; Some shelving in cargo area; new alternator 12/14; new brakes/lines 12/2015; Carfax report when purchased in 2014 showed 1 owner. Mileage 164,257. Price $2500 OBO.